A 40 year-old man with necrotizing pneumonia is receiving V-V ECMO support. He has been converted to a high-flow configuration (access cannulae in the right internal jugular vein in addition to the right femoral vein) to manage persistent access insufficiency. Unfortunately, despite this, he continues to have access problems. Q1. What problems may be contributing to persistent access insufficiency in this scenario? Echocardiography with lung ultrasound is performed at the bedside. This confirms the presence of large loculated pleural effusion is compressing his superior vena cava (SVC) and right atrium (RA). Q2. What are the management options? Q3. 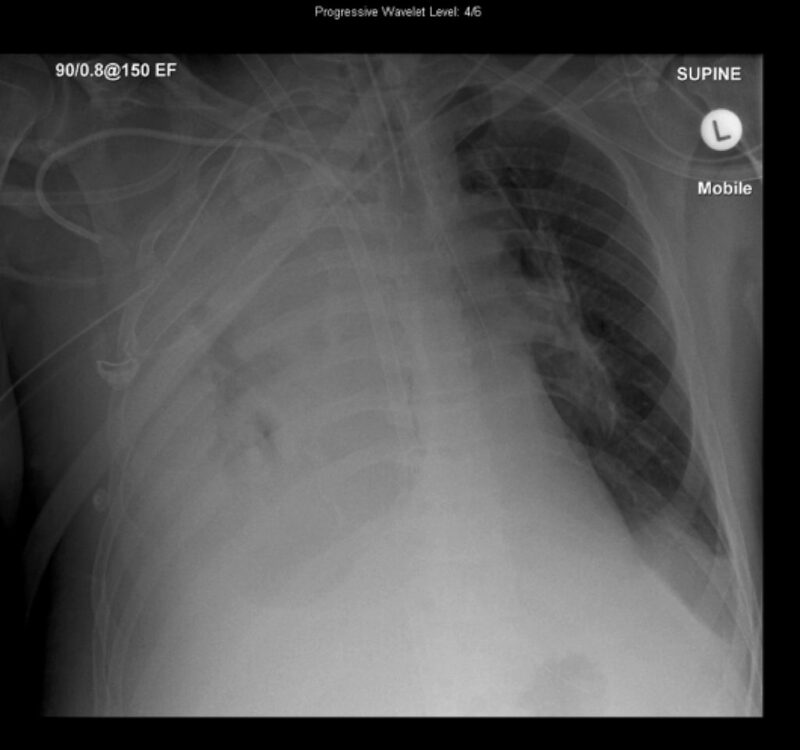 What are the risks of surgical intervention while the patient is receiving ECMO support? The risk of bleeding with any procedure performed on an ECMO patient is significant and potentially life threatening. Haemorrhage is the most common complication of ECMO, due to the need to anticoagulate the circuit as well as circuit related factors. All interventions require a careful weighing of the risks and benefits. You manage to provide support for him for two more days despite the access insufficiency (Sa02 > 90%, HR <120/min, noradrenaline <10 mcg/min, lactate <4 mmol/L) but eventually decide, following discussion with your cardiothoracic surgical team, to proceed with a VATS procedure. Q4. How will you manage the patient’s anticoagulation? Most ECMO centers advocate withholding anticoagulation for 12 hours prior to, and 24 hours after, major procedures. Modern ECMO circuits are entirely heparin-bonded, which decreases the risk of circuit thrombosis over short periods in the absence of systemic anticoagulation compared to older circuits. On return from the operating theatre following the VATS procedure, the patient remains stable. Ten hours later, a routine plasma-free haemoglobin (PFHb) measurement comes back at 0.11 g/dL. Q5. What does this laboratory result suggest? A PFHb > 0.10 g/dL is a sensitive indicator of haemolysis. In a non-anticoagulated ECMO patient this raises the concern that circuit thrombosis is starting to occur, which can cause haemolysis. Artefactually elevated PFHb levels can result from sub-optimal blood collection. If there is a low index of suspicion for haemolysis, a repeat sample should be checked. In this case, the elevated PFHb level is confirmed. Given this information, you decide to restart a heparin infusion. Five hours after restarting IV heparin, the patient becomes hypotensive with escalating noradrenaline requirements. You notice that 1L of blood has “dumped” out of his right-sided chest drain. Q6. What is your approach to the management of this new issue? Significant haemorrhage from a necrotic lung can be very difficult to control. This patient has a high risk of death.